In January of 2017, the worst wildfires in Chile's history rampaged through over a million acres of land, destroying homes and leaving at least 11 dead. One of the many recovery solutions, as reported by Mother Nature News, is unexpected—and very cute. Enter dog trainer Francisca Torres and three border collies, who took to the scorched forest after the fires were extinguished. 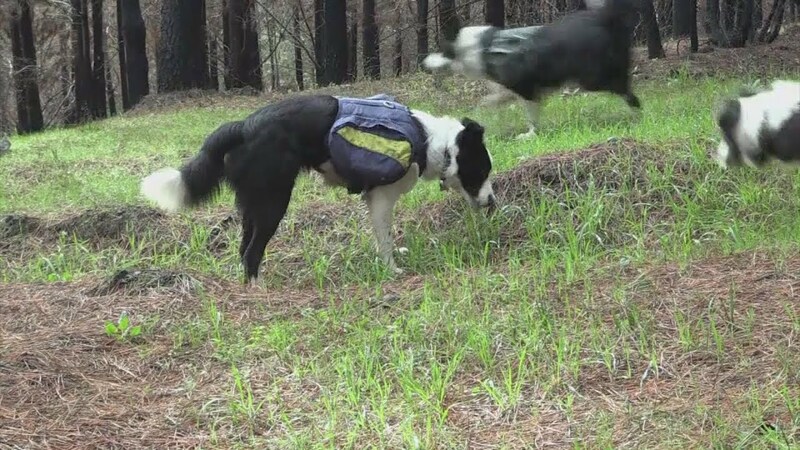 Each dog wore a specially designed pouch filled with native seeds; as the dogs happily sprint through the forest, the seeds scatter from the pouches. Border collies are work dogs. They're by far the most popular choice for herders, as their work ethic, herding instinct and intellect—they're routinely listed as the most intelligent breed of dog—make them ideal for farm work. These dogs can cover up to 18 miles each day, far more than a human could, and what could be more fun for a dog than being rewarded for sprinting through a gigantic forest? Seeding after a fire, interestingly, is a widespread practice that is not without controversy. Fires are an essential part of the life cycle of many forests, with an established pattern of recovery: A certain type of fire might encourage a certain type of seedling, which could be eaten by a certain animal, which could attract other animals, and the entire system comes back online. In any case, post-fire seeding with exclusively native plants is not widely controversial. You know what else isn't controversial? Very good dogs running freely around a forest.